It’s Super Bowl Sunday and the Eagles weren’t playing, so what is the best idea of the day? 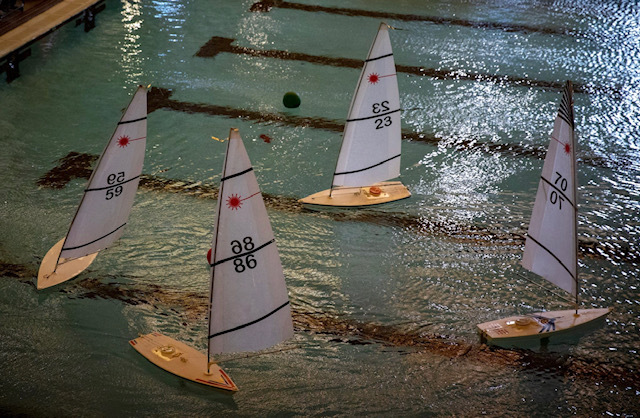 Head to Lake Naomi in the PA Poconos for the RC Laser World Indoor Regatta. 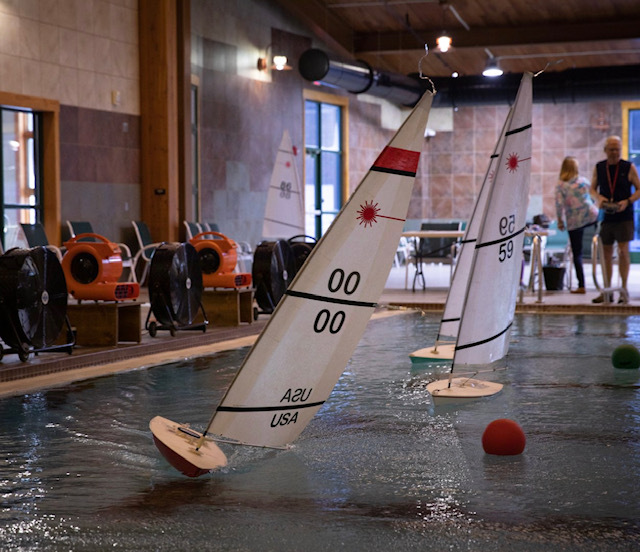 It’s an invitational regatta that is held each year at Lake Naomi’s indoor pool. The weather is always a balmy 80 degrees with 6 to 8mph winds out of the East, driven by 10 commercial fans and a lot of electricity. The racing started at 7am and lasted until 11am with two breaks to cool off and get your heart rate lowered. This year 21 races were completed using the Cess-Pool system. 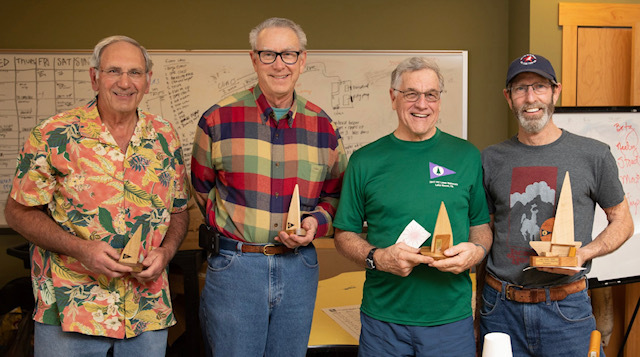 They were two new invites, John Stoudt, Vintage Model Yacht Group President, and Mark Daddino, Fleet Captain of the Raritan Yacht Club RC Laser Fleet. The racing was as fast and furious as you can imagine. 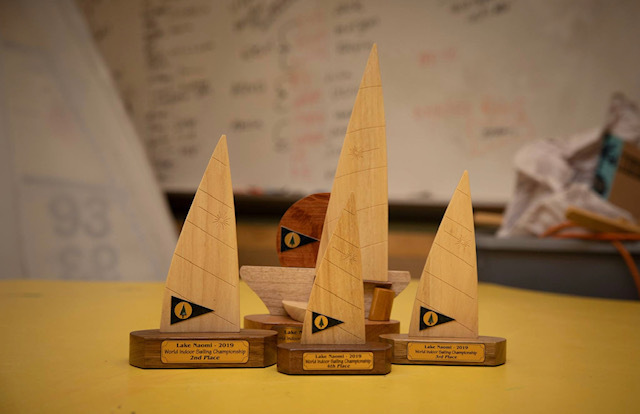 Jamie Betz was the winner of the regatta with just 14 points, followed by Dean Neely with 25pts. John Stoudt was third and RC Laser Class secretary Nick Mortgu 4th. 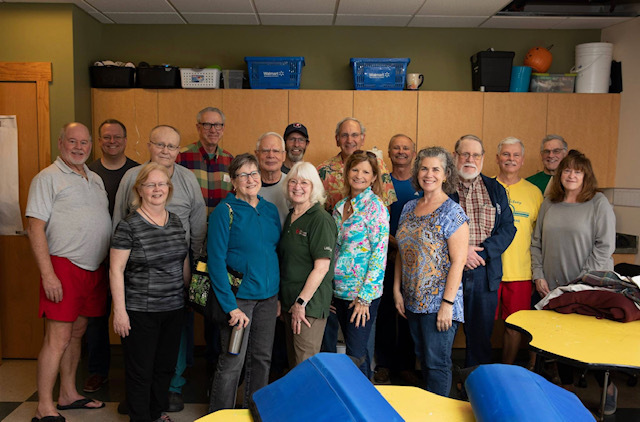 After the awards were presented and everyone changed out of their shorts and Ts it was off to the Jubilee for breakfast to laugh about the fun had on a cold and snowy day! Click on the left or right edge of the photo below to cycle through the images.